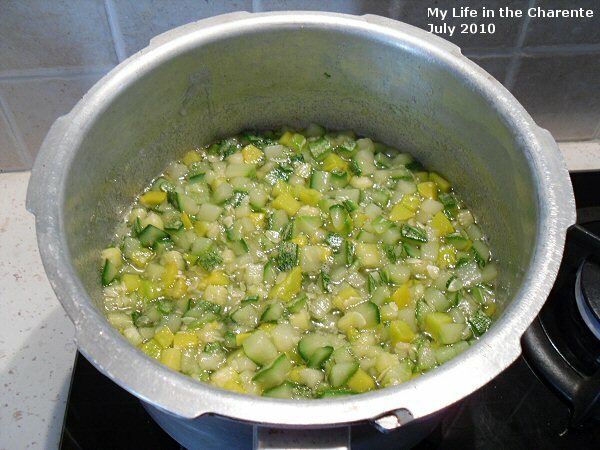 Only 4 ingredients - courgettes, 1 lemon (juice and grated skin), jam sugar and ginger! 1.2 kg courgettes (weigh after peeling [if necessary] and deseeding, chopped into small 1 cm pieces). Two different types of jam sugar found here in France. Meanwhile put well washed jars into the oven at 100C to heat and sterilise them. Put into hot bottles and seal. 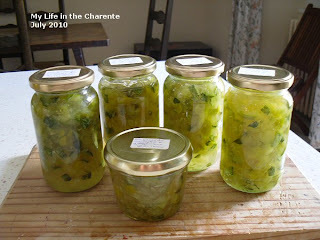 Allow to cool and as the jars cool the tops should 'pop' and seal. I am still using the last bottles from last year, so this jam keeps well. Yet another stage win for the French, and a second place as well, so we are all very proud of their success this year. I was quite sad that Lance Armstrong, who made a strong bid in the sprint to win this stage, only got 6th place. There was no change in the yellow, white, or polka dot jerseys, but Thor Hushovd has regained the green jersey, 3 points ahead of Alessandro Petacchi. 21 July was a rest day, giving the riders a chance for recovery before the final 4 days of stages. I have made vegetable jams in the past and they languish on the shelf... what do you do with them, Diane? Your recipe looks so green and delicious!! 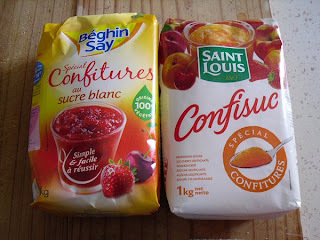 Je suis absolument époustouflé du nombre de personne qui suivent ton blog !!! This is a squash jam...right? I've never heard of that...would you eat it on toast or biscuits or with savory dishes? This sounds so interesting! I just picked up some ginger jam. I would love a jar of yours! It looks beautiful in that lovely photo you took! Put vinegar, sugar and spices in large saucepan and stir over medium heat until sugar dissolved. 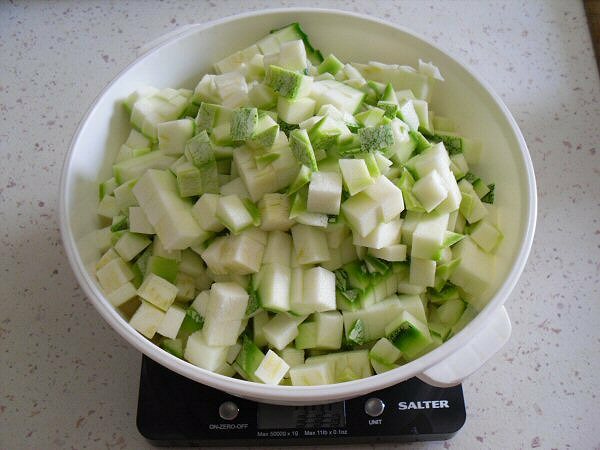 add cucumber and onion to pot. bring to boil and simmer uncoverd for just one minutre. seal immediately and store for a month before serving. This is a similar recipe to Marrow and Ginger jam I made last year, and it was the absolute best for using as a fruit ingredient in cakes, especially if spooned over the top of the cake before cooking. Made the cake all yummily sticky. Will have a go at this recipe as well. I see you are becoming more French every day!! LOL!! And when the weather is rainy, it is a great occupation! We had 14.5 ml of rain yesterday alone! great for the garden, less for me!! But it allowed me to change from Canalblog to Blogger since it was becoming a pain to publish my pics! Ps: I also changed my pseudo from Carlib to Noushka! LOL!! Carine I have just looked at your new blog. Great new look Noushka. I keep meaning to ask you, I presume all the drawings, which are excellent, are your own? This is so very deliciously beautiful. What a lovely comfort to have it on my pantry shelf. And, here in the midwest, we have a wonderful number of different squash to choose from. Great thing to do with your courgettes! My mother in law used to make pies from her winter squash. But those are not such a problem as the summer squash or courgettes, because they'll keep a reasonably long time.